Be the first to share your favorite memory, photo or story of Deacon Franklin. This memorial page is dedicated for family, friends and future generations to celebrate the life of their loved one. 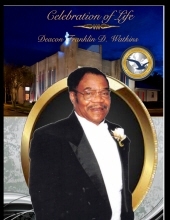 Deacon Franklin D. Watkins, Sr. was born December 30, 1933 in Crystal River, Florida as the youngest and last remaining of 20 children of William Watkins Sr. and Ida Daisy Robinson-Watkins. He was educated and a graduate of Inverness High School. He was married to his high school sweetheart, Altamese Hooks for 66 years and remained with her until his final day on this side. He was one of the Found-ing Deacons of Greater Refuge Church of Our Lord and was the remaining original deacon. Deacon F.D. Watkins worked with Apostle Henry Ross to develop and complete the vision and design for the Greater Refuge Temple as it stands today. After a 12 hour shift at “Bonnie Plant”, he would return to the church to manage, repair, and operate the commercial motor coaches at the Church , which were used to evangelize the entire State of Florida. If the bus broke down, Deacon Watkins could put it back on the road with a twig. He could do it. Deacon F.D. Watkins served in a multitude of capacities at Greater Refuge Temple ; Chairman of Bus Committee, Deacon Board, Regional Chairman of Deacon Board (COOLJC), Building Superin-tendent, and Spirit of Refuge Quartet (Lead Singer/Guitar Player). Additionally, he was Treasurer for the Florida State Convocation. Professionally, he retired as Supervisor at CF Chemical Industries af-ter 44 years of honorable service. On December 2nd, 2018, he received his final call to the Kingdom by His All Powerful & Loving Savior, Jesus Christ. He will be forever remembered, missed and loved for his faithfulness, total commitment and service. He leaves to cherish his memory a loving wife, Altamese J. Watkins; children, Lillie Del Johnson, Tonia M. Oldham (Chuck), Kenneth J. Watkins (Wanda), Jeffrey D. Watkins, Alfred A. Watkins (Crystal), Bishop Alonzo A. Watkins (Clarissa) and Sylvia R. Brown; a host of grandchildren, great grandchildren, in-laws, special sons & daughter, cousins and other relatives. Visitation will be Saturday, 10 am– 11 am at Greater Refuge Temple (1258 N. MLK Jr., Lakeland). Life Celebration Service will begin 11 am at the Church. To send flowers or a remembrance gift to the family of Deacon Franklin D. Watkins, Sr, please visit our Tribute Store. "Email Address" would like to share the life celebration of Deacon Franklin D. Watkins, Sr. Click on the "link" to go to share a favorite memory or leave a condolence message for the family.